The Adjustment is a symbol for the balance of contrasts, complementing one another and also building up room and time. She combines the High Priestess and the Magician. Both are connected - true, conscious action results from realization, wisdom is based on action. The principle of activity completes itself with the passivity of inner reflection, the adjustment being the balance in between. Another common name of this trump is 'Justice' - the card tells one to be righteous in all aspects of our life, to ignore, surpress or prefer none if need be. Only when we have an objective view of all and accept them, can we can find inner balance and silence. Therefore, the Adjustment stands for uncompromising honesty and objectivity, the realization of cause and effect, background and consequence. 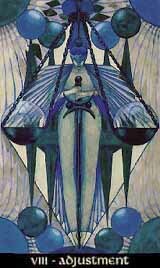 Oh, by the way - it wasn't Crowley who reversed Trumps VIII and XI (Justice and Strength). If you look at old historical decks, the Justice has been the 8 ever since.